Our local host on the Banks Peninsula, Shireen Helps, tells us about her penguin conservation efforts and the Peninsula’s busy eco-system. Hi Shireen. Thanks for talking with us. So how long have you been working with penguins? Well, we have been in Pohatu for over 40 years. But we became aware that the penguins were disappearing from the Banks Peninsula around 30 years ago. We then started looking critically in our own backyard, and that’s when we starting finding dead penguins everywhere. We thought, if someone doesn’t do something to save this colony, these penguins will go the same way. So that’s when we started the pest control. Nobody else was going to do it! The conservation society thought that saving the penguins would be too difficult, and would be a waste of taxpayers money. So we had to prove it is possible, and it is! You mentioned pest control. Are pests the main threat to the penguin population on the Banks peninsula? A lot of animals have been introduced to New Zealand’s eco-system because of migration. Originally New Zealand was a land of birds. The only way we can save certain species is by pest control. It is one of the most important things we can do. So we set up pest-traps for ferrets, stout and weasels. They were introduced to try and control the rabbit population. Mice and rats were also accidentally introduced into the country on ships, so the ferrets, stoats and weasels were introduced to control them as well. Are you involved with research at your colony as well? We are involved in lots of research in this colony. For example, we did a 15-year breeding study on the penguins, to find out more about the success rates of breeding against sea temperatures and sea activity. We have lots of students who come and conduct studies as well. These studies have been on penguin calls, the impact of light disturbance on penguins, but mainly the impact of predators on penguins. One of the biggest threats to penguins these days, especially yellow-eyed penguins, is uncontrolled tourism. We are very strict on guided trips, we don’t allow free viewing of the penguins as it has a disastrous impact of the penguins. And is a lot of the penguin disturbance man-made, or a result of their natural habitat? At night, we found a lot of the disturbance is a man-made. So after dark, it’s penguin time. We don’t run a penguin parade here. A penguin parade is when tour operators allow humans to go through the colony at night to see the penguins caring for their young. They shone lights so the tourists can see the little guys, and it’s very disturbing for them. That’s what we call a penguin parade. We don’t have any of those here. It’s very commonly done. However in Pohatu, this is the largest natural penguin colony in mainland New Zealand. As their behaviour patterns haven’t been studied by humans, it provides a unique opportunity to study. We are lucky that we have a place where penguins can behave normally. Where penguins can be penguins? Yeah, where penguins can be penguins. So what measures can you take to make sure that your guests don’t have an impact on the penguins? We wear camouflage clothing, and we have hides that people can observe from, and we stay very quiet. Some people are very noisy, so we only have small groups. And do the penguins have an impact on the wider ecosystem? Not so much on land. But we have been lucky to observe feeding. It normally happens far out to sea, however when it happens in bay, we notice that there is a lot of cooperation as far as sea-birds are concerned. The penguins work alongside the turns, the gulls and the shags. When the penguins dive, all the other birds dive too. They used the penguins to confuse the fish, and the chances are there are dolphins and seals down there as well, joining in. So it’s a bit of a free-for-all. The penguins help the other seabirds to feed by making themselves a distraction, so they help to support the livelihood of all the sea-birds in the area. In general, we don’t know what the impact of a penguin extinction would be on the wider eco-system, but our guess is that it could be disastrous. And I believe you have a penguin rehabilitation programme as well? If they need any veterinary care, I’ll often look after them. I’m quite often trotting them up to Christchurch actually. We also have an adopt a penguin scheme. You mentioned earlier that breeding the penguins was a problem. Why is this? Put it like this. Of all the penguins, one third of the penguins might manage to raise one chick, one third might manage to raise two, and one third might fail completely. Out of all of the chicks, at very best, 50% will make it back. Penguins also get very territorial about breeding areas, so the more space we can give the penguins to breed, the more successful they will be at breeding. And so how will more guests help you to conserve the penguin colony? Well, we provide people an opportunity to see them without being part of the problem. It also gives us funds for the trapping programmes, paying the wages for the staff to do some of the trapping. It also helps to provide a wage for our staff to actually do the trapping themselves, and also for breeding boxes. And what are the characteristics of the wider Pohatu area? 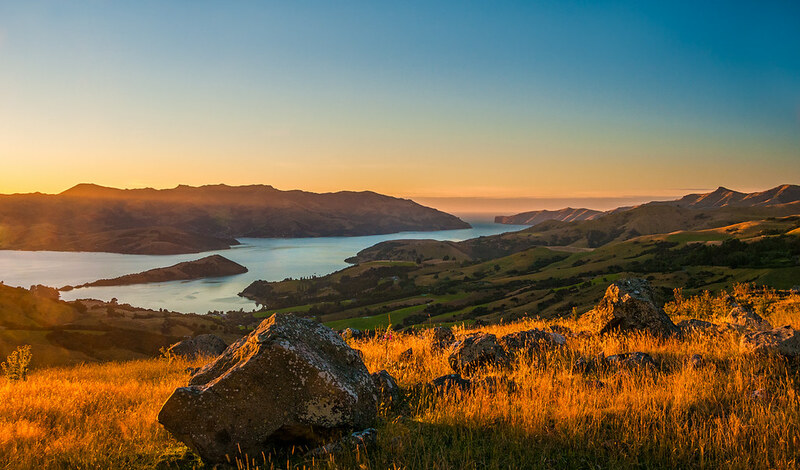 It’s called the ‘wild side of banks peninsula’. The landowners around here are very much into conservation. It’s very rugged, it has a lot of bush, it’s quite park-like, in that it has large areas with grazing sheep. There has very rugged gulleys with waterfalls, and very steep plunging cliffs. Of course you have the beautiful beaches with a nicely sheltered bay. It’s just perfect bay for kayaking. There are heaps of penguins obviously, dolphins, seals and otters. Sounds like a busy neighbourhood! So do you get to do some kayaking tours yourself? Well you know I’m getting on, but I still do some tours from time to time. I let the rest of the family do that mostly. We have a lot of family employed here. And generally, how do your guests enjoy your kayaking tours? *Laughs* That’s the best inadvertent advert I’ve ever heard. Because we aren’t really a commercial venture, and we aren’t into exploiting the wild-life for financial gain. We don’t want to be part of the problem. We are, as the review said, a small family looking after some penguins. Thanks for speaking with us Shireen! If you’re interested in aiding penguin conservation on the Banks Peninsula, join Shireen on a penguin watching and kayaking tour in Pohatu.